First of all we would like to say "Happy Halloween!" to everyone out there. We got the idea of making a scratch off lottery ticket because we like scratch off lotto. 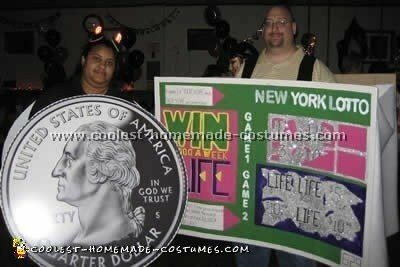 Instead of making two tickets we used the second costume as the coin. To make the lotto ticket we went to our local craft store and purchased the "Elmer’s Folding Project Cardboard." Using paints, markers, pencils and glitter we recreated the basic template of the scratch off lotto. On the back of ticket using a black marker and ruler we hand wrote the rest. Unfortunately we were running out of time so we found a high resolution picture of a quarter front and back online. I called up a local printing press and they printed it out. I brought the copies home, cut them out and mounted them on some cardboard. Each costume, front and back was then connected with felt strips put over the shoulders using the hot glue gun. When we arrived at the party that night everyone, strangers alike had to take a picture of us. They couldn’t believe how realistic we looked.